Part I : Who the Hell Fills Up at Petron? Don't worry, this is not going to be a deep dive into the fundamentals and cash flows of refinery companies. 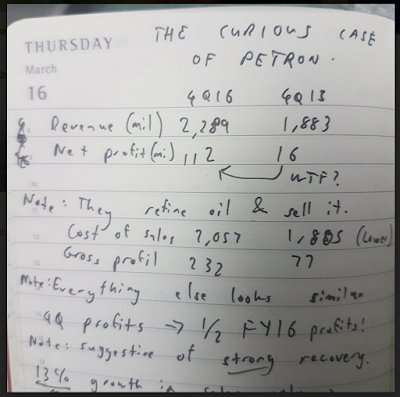 It's just a full, uncensored, transparent account of my experience with two of last year's biggest gems : Petron Malaysia Refining & Marketing Bhd and Hengyuan Refining Company Bhd. Let me start with a bit of background : At the start of 2017 I was completely biased towards an oil price recovery scenario. I'd love to buy a fundamentally sound oil and gas company, but there didn't seem to be any. For the most part, anybody involved in the upstream segment was still royally screwed. The lag time between crude oil's price recovery and the demand for upstream drilling services is too long (I've read and written many wishful thinking-type stories on this very subject). Or you may count on Petronas as a long term benefactor, but your earnings are constantly sucked into a debt-servicing vacuum. So who are the oil and gas players who can maintain stable earnings in a benign oil price environment but can quickly report fantastic earnings as soon as oil prices rally? It's the refineries. As an added bonus : were refineries deeply unloved by investors at the beginning of 2017, as shown by their single-digit PE ratios? Were they being completely ignored by analysts who were averse to being bold? * Yes and yes. 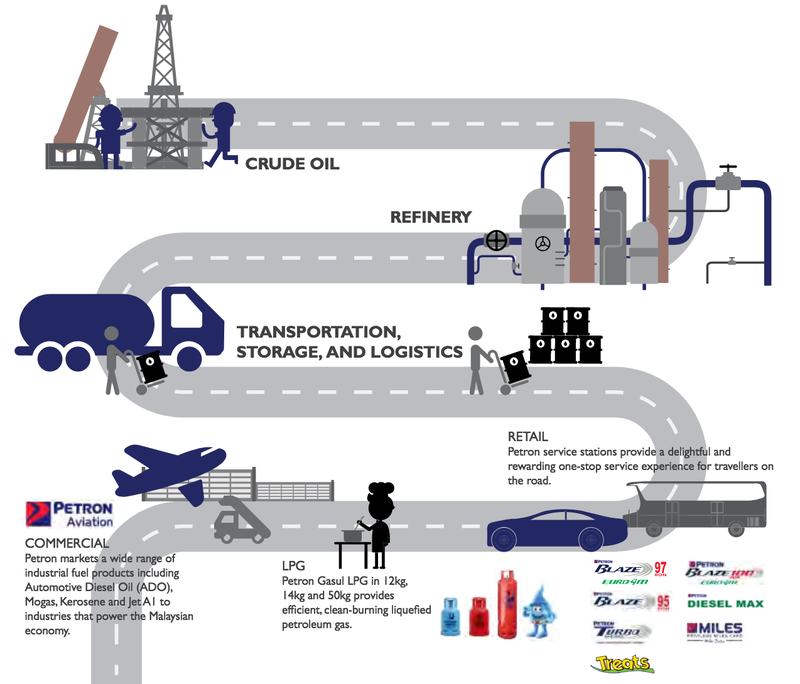 I was enthralled by Petron's potential. Its 4QFY16 results announcement on February 22 caused a spike in the share price the next day : it went from RM4.50 to a peak of RM6.48. The price then stagnated for about a month (the stock prices have been adjusted to reflect dividend payouts during the year). During this time (of stagnation), I thought long and hard about initiating a position. About half of its FY16 earnings came during 4Q alone, and it was ten times the 4QFY15 earnings. Their respective revenue and gross profit figures suggest that the earnings recovery was real. And this was a single-digit PE company that paid dividends during the bad times! March 16, 2017 entry on my trading journal. 1) The sloppier the handwriting, the more excited I am about a stock. 2) My best preliminary layman analysis at the time : 'they refine oil and sell it'. 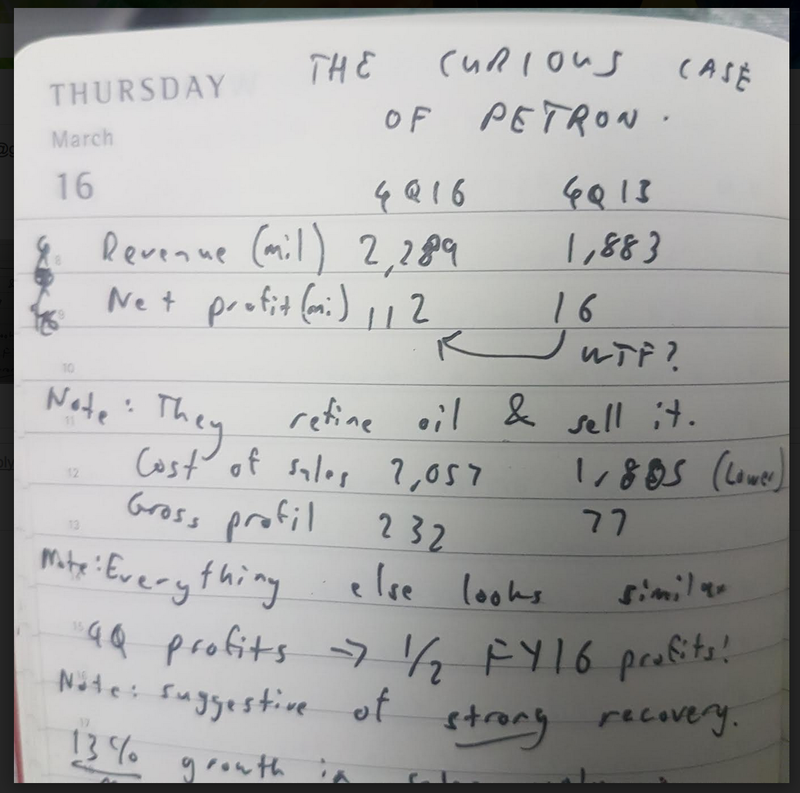 3) The earnings recovery puzzle : did an extra 10,000 people a day started filling up at Petron stations in 4QFY16? Who knows. One clue was that they reported higher sales during a quarter where the government set petrol pump prices were higher compared to the same quarter the year before. After a slightly more thorough due diligence process, I was confident that a rally of at least 30% is realistic - this is a prediction that Q1FY17 numbers will reflect a continuation of the 4QFY16 recovery trend. I'm aware of what the technical analysts are thinking - they will say that the next 'points of interest' are at RM6.48 (the recent peak) and RM6.70 (the previous peak in 2016). I began accumulating a cheap call warrant, Petron-CC, when the stock was trading at around RM5.70. Ignore the technical analysis. My parameters for this trade were very simple. It only needs to rally beyond RM6 and stay above that point over the next two months. That's only a 5% increase in the stock. At that 5% gain level my call warrants would already be profitable - from that point on I can stay with the position and rely on the profit buffer. But Petron's stock has to rise over this two-month period, or time decay will start affecting Petron-CC's value. My deadline for this trade to work was the next quarterly earnings (since this is a one-quarter thematic play). And my conviction was strong enough that I accumulated a massive position gradually; a one sen move in the call warrants translates to a RM2,800 profit/loss. I finished buying by April 1. By May 15 Petron's stock hit RM8.70 - a 52% increase. I hit the jackpot, but I made a pretty big mistake during this time. I failed to stick to my own plans - a typical human failing. 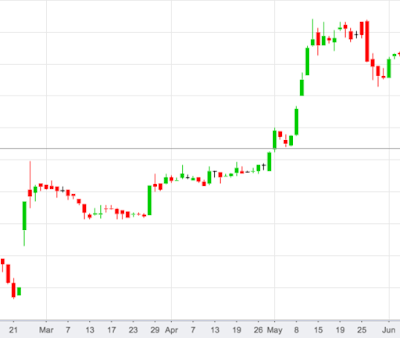 Instead of selling just before the 1Q earnings (sell on news; trading interest wanes once the anticipated material information becomes public), I decided to stick beyond May. I convinced myself that the warrants can weather any short term decline post-earnings and continue to rally further. Petron's price did recover but I was betting on the wrong horse (warrant) by that point. May 26 journal entry. By this point I was trapped in a big position as the warrant plummets. As expected, there was an immediate decline in the stock after its earnings release (the numbers were excellent). It fell from RM8.67 to RM7 in a month - a staggering 20% decline. I then failed to remember that a volatile stock translates to a much more volatile warrant. My holdings fell enough to cut my profits by a third. Note that the warrants never followed Petron's trajectory thereafter. It stagnated until its September expiration date. This was the end result. I wasn't complaining, but it's normal to feel like an idiot when you threw away thousands of ringgit in profits. In other words, good planning, but terrible execution. Some RM9,000 in losses were subtracted from this final net gain figure. By this time (June), the market has begun paying attention towards refineries. Petron continues to rally towards RM9 by August. By then I knew there will be further opportunities to trade. Part II : Hengyuan Emerges.. and FOMO Strikes! If you're still reading at this point, I'll reward your tenacity with a brief fundamental background on Petron. It currently has the third biggest market share in the country (from zero brand recognition in 2012), it opened more stations than any other brand in 2015 and 2016 AND 2017, it counts on its big Filipino parent group for support, and it's an integrated downstream player (they refine, sell, and distribute the oil to their Petron stations). The company owns the bulk of the stations after taking over Mobil's sites, but they also have a franchisee program that offers better rates for vendors than Petronas. Their improved sales numbers seem to come just from having more stations and having better brand recognition among customers - aside from improved selling prices. Geographical focus must have helped too - they focus on underserved locations in states like Johor, Pahang, and Kelantan, not the Klang Valley. However, having retail and distribution activities as well as new station openings involve substantial and ongoing non-refinery related capex commitments (it's easier to calculate a 5-year capex when you're just building/upgrading a refinery). Lower gross profits from these other operations can eat up into the fantastic margins reported by Petron's refining and sales activity. So you'll likely get lower gross profit margins at the group level. So if you really only care about the refinery angle, the solution is to buy Hengyuan shares. They just do refining and sales, and the Shell Group buys their stuff under a long term agreement. It's owned by a Chinese company who bought a 51% stake for the low, low price of RM1.92 a share. On paper the Chinese are currently sitting on a 750% gain in less than two years. This is all Hengyuan needs to keep doing : take care of the 'products' and the 'pipe'. 'Pure play' (focus on one thing only) companies like Hengyuan promises higher profit margins than integrated players like Petron because its commitments are more concentrated (build refinery, maintain refinery, increase production capacity). They don't have to spend ever-increasing amounts of money on building and operating petrol stations. I've had a cursory look at Petron's and Hengyuan's respective refining operations and their average production capacities; assuming they're selling the same type of refined products, their gross margins from refining during a typical quarter should be similar. It's the other stuff that eats you up - old capex, new capex, forex hedging, anything. Petron also does not disclose an earnings breakdown of their refining, retail, and other operations. In each of the past three financial quarters, Hengyuan's profit margins have been consistently better than Petron's. I just wanted to mention the oil price recovery theme in all of this, but beware of how boring the following sentences are : Improving oil prices are generally good for refiners up to a point ; it depends on their crack spreads. Another variable for these companies is stockholding gains ; higher oil prices translate to higher inventory values on all the stuff they store in their tanks. To reflect improving oil prices, they can recognise the quarterly increase in inventory value as part of their profits. Their selling prices are based on global benchmarks, so a short term supply disruption globally can be good for these guys, even if they predominantly sell oil in the domestic market. Anyway, Hengyuan has rallied alongside Petron since March, but it didn't have a call warrant. Only in August did one investment bank issue Hengyuan-CA and a few other call warrants, and the market went nuts. External factors didn't seem to have led to this - Brent crude prices were still languishing in the 50s. Whether by luck or design, the stage was set for speculators to demonstrate their FOMO - they simply can't afford to miss out on another Petron. Hengyuan was hit with a market query just a couple days before Hengyuan-CA was listed. It ensures that the first day of trading on August 2 will be crazy, and so it was. Hengyuan-CA went from 38 sen to 74 sen in two days, or a 138% gain. Speculators, syndicates, crooks, and investment bankers rejoiced (I'm not saying you can't be one but not the other...). I had a bout of FOMO too - a typical human failing. So I bought some Hengyuan-CA for short term trading. Plus, I had Hengyuan in my watchlist since March - I was preparing myself to trade this thing for about five months, or so I thought. It turned out to be a very good investment indeed! By now you may have noticed that Hengyuan-CA is worth around RM1.25. That's a 300% increase in about four months. It's like owning bitcoin in 2013 and selling it in 2013. So what happened? The simplest explanation is that I bought it and sold it at the wrong time. I did not have the confidence to stay invested and my timeline for the trade was all wrong. The warrant remained flat at 30 sen for about two months with no recovery in sight - until November when it skyrocketed. I understood the fundamentals and the sentiment behind Petron, but I failed to do the same kind of due diligence on Hengyuan. It's just hubris - you think you know so much, but you don't. The lesson here is : do your homework. The whole experience taught me the value of having real convictions and sticking to what I know. In this case, it was Petron. Back to August 2017 : the mania in Hengyuan warrants (Hengyuan-CA was just one; CB, CC, CD equally went nuts) sparked a resurgence in Petron call warrants. The stock has well and truly recovered from its post-earnings lows and the upsurge in sentiment toward Hengyuan is benefiting Petron. I should note that in this situation this is a sentiment trade, it is strictly not a fundamentals-backed trade - I'll explain this strategy another day. The second lesson is : stick to what you know and understand. Also, there are few clean outcomes in investing or trading. But you'll come out ahead if your gains (correct analysis and optimal execution) outweigh the losses (sheer foolishness). * By this time it's not a bold call anymore. 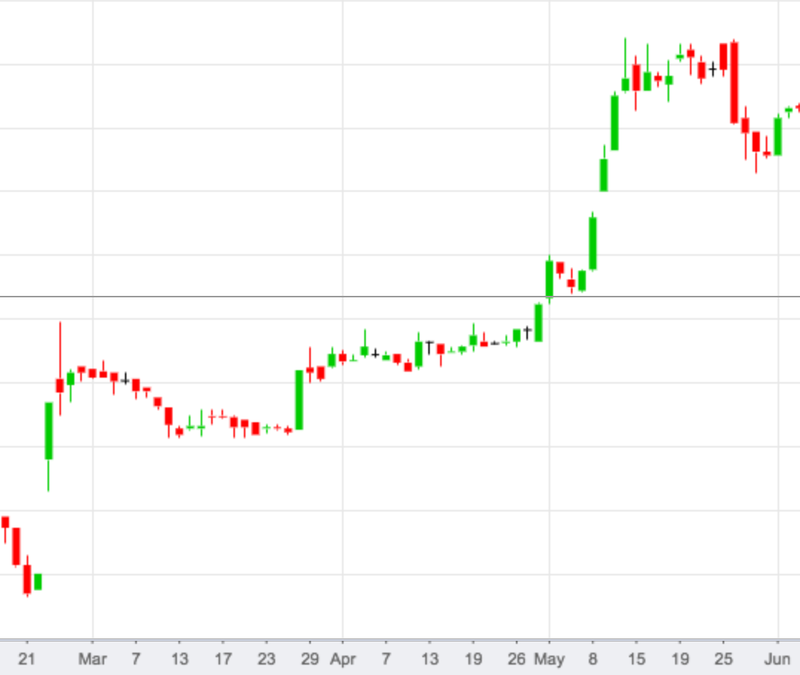 Dislaimer : This is an investment newsletter outlining my market views on trading, Bursa Malaysia, economics, global markets, currencies, and other financial topics. On a regular basis, this will be an outlet for expressing somewhat contrarian views backed with some empirical research and personal market experiences. From time to time, I will also share the progress of ongoing trades and what I think of them, but they should not be construed as stock tips. I hope to provide thought provoking content and investment ideas which you may not find elsewhere, as well as some that you may vehemently disagree with. Feel free to berate me with your thoughts and thanks for reading. Brief background on the author : I'm a finance journalist who has worked with The Edge and StarBiz, two of Malaysia's top business publications for a number of years. I started out as a remisier, but I'm glad to say I was a terrible one (don't take your remisier's advice seriously; your economic incentives are misaligned). I've been trading for about four years, although my focus is more on longer term holdings nowadays instead of day trading. I'm currently based in Hong Kong working on bank risk management practices and European financial market regulations. Look up my professional profile here . 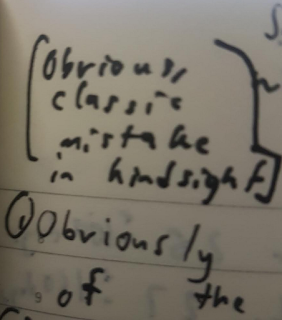 Very good that you’re writing down your decision making principles when investing. Worth investigating why your thinking didn’t trigger you to repeat the Petron warrant thought process. A very good sharing on your experience. Thumb up!